The founders of Nigerian startup Termii, a networking platform that integrates social, personal and business structures on a unified network, believe the company has a bright future in spite of being forced to go back to the drawing board after negative feedback to its first version. 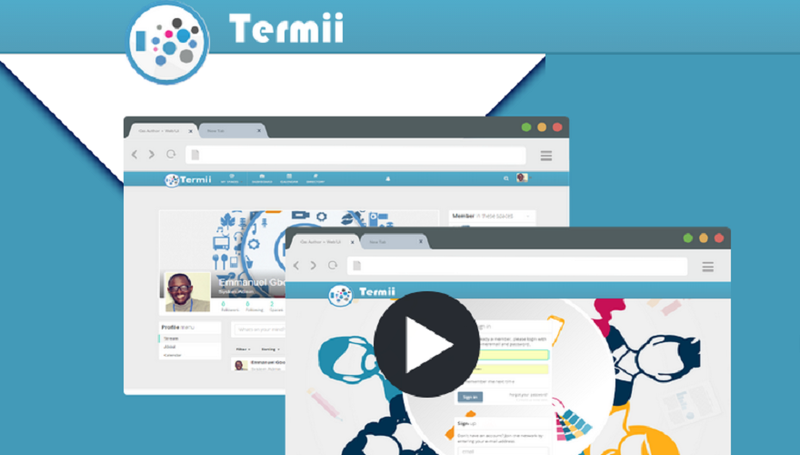 Founded in March last year, Termii is an enterprise solution that enables businesses of varying sizes and schools to create online work spaces complete with collaborative tools that enhance productivity and efficiency. The site offers a free version or paid extended versions such as Termii for Teams, Termii for Companies and Termii Enterprise. Investors have liked the idea. Termii crowdfunded US$5,800 at the idea stage, and then raised a further US$5,000 from angel investors. The initial market response was positive as well. “We built a freemium version for testing and got over one million hits on our sites and over 50,000 unique visitors,” Gbolade Emmanuel, co-founder and chief executive officer (CEO) told Disrupt Africa. However, Termii was forced to respond to some user dissatisfaction on its feedback page, so retracted the product and went back into beta. It went on to receive detailed analysis and assistance with market potential from Jordanian investment company OASIS 500. “We rebuilt the entire system and finally early this year finished what we call Termii for Individuals, Termii for Teams, Termii for Businesses and Termii Enterprise. We have launched Termii for Individuals and are about to roll out the rest at the end of this month,” Emmanuel said. Emmanuel said the lesson Termii had learnt was never to think the job is done. “I would say 1,000 times over, never think you have built the best solution, a platform is never complete. It needs upgrades and changes, and, most importantly, what they told us after series of monthly meetings: don’t build what you think the market needs, build what the market actually needs and is willing to make a habit of using,” he said. The company is now ready to progress, and is in the process of raising a US$100,000 funding round. Emmanuel feels the product has tremendous potential. Google Apps, Prowork and Facebook For Work provide international competition, but Emmanuel said Termii differentiates itself with its public collaborative space setup, which includes a custom modeling system and an enterprise solution for SMEs, schools and corporate organisations. The company has a four-tiered revenue model: freemium, premium, business and enterprise. The freemium model offers free access but with individual paid custom offerings, while the premium and business models are available at a fixed price for monthly or yearly access, and also come with custom individual features. Termii’s enterprise model offers, at a fixed fee, adaption of the solution to suit an organisation’s servers for private us, with the option for custom features. “This option allows groups of companies to manage staff from one single database, but with the option of having custom features adapted to each company’s platform,” Emmanuel said. Emmanuel is targeting expansion to neighbouring francophone countries such as Ivory Coast and Senegal by April this year, and feels the company is set for success after honing its product to make it right for the market. “We are a long way from our dream but where we are going is a place where business, work and play are all done from one platform,” he said.